The nail patterns in the subfloor should be inspected once the floor panels are in place. Staggering the panels eliminates continuous joints in the flooring and correct sizes, penetration, and spacing of the nails ensure that the structure acts as a continuous horizontal shear plane to counteract any possible lateral or twisting forces. The walls are framed with studs equally spaced between top and bottom plates of the same width. The plates are cut to fit layout lines chalked directly on the subfloor for each wall. The plates match the length of the wall with spacing for studs, trimmers, and headers marked directly on the plates. All the pieces for the wall are precut and bundled as a package to speed final assembly. The framing for the outer walls are installed first. The studs in the outer walls are thicker to add strength and allow for insulation. 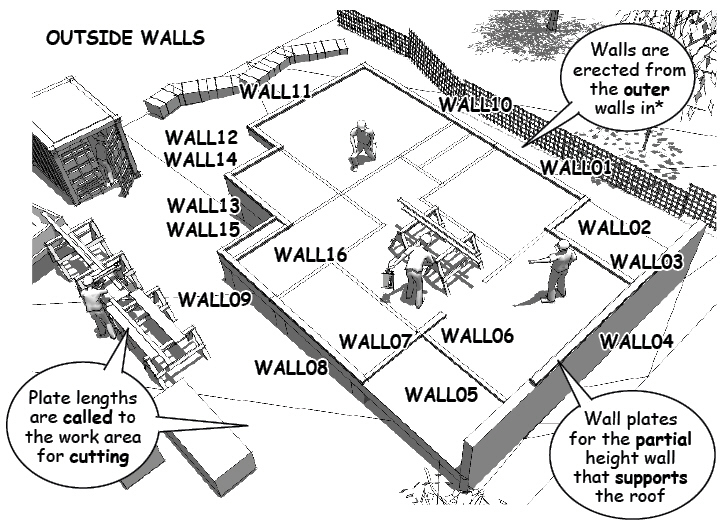 The sequence of installation for the interior walls is determined by the carpentry foreman according to the location of corners and wall intersections. Studs are added at these corners and intersections as backing for wall board to be applied once the framing is complete. The framing team is composed of a cut man (or woman) at the work station in charge of bundling the pieces for each wall. 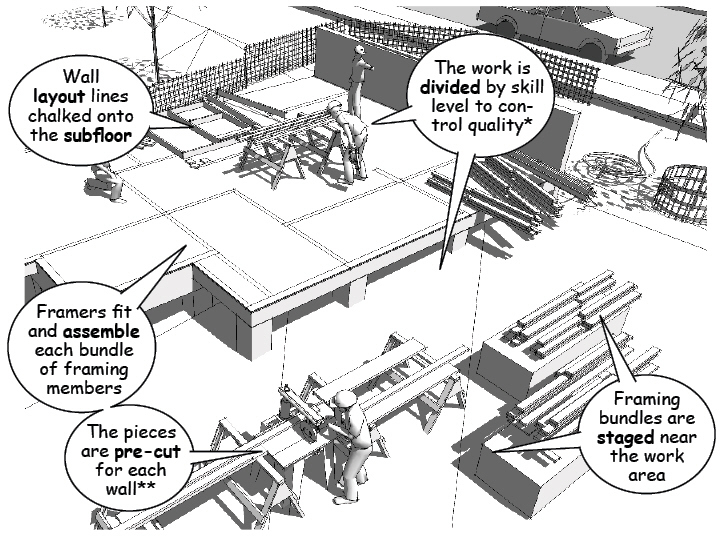 A lead carpenter calls out the lengths, sizes, and pieces required for each wall and the carpenters then assemble the walls as the prefabricated bundles are completed. Each bundle includes the top and bottom plate, studs, headers, and trimmers necessary for that wall. 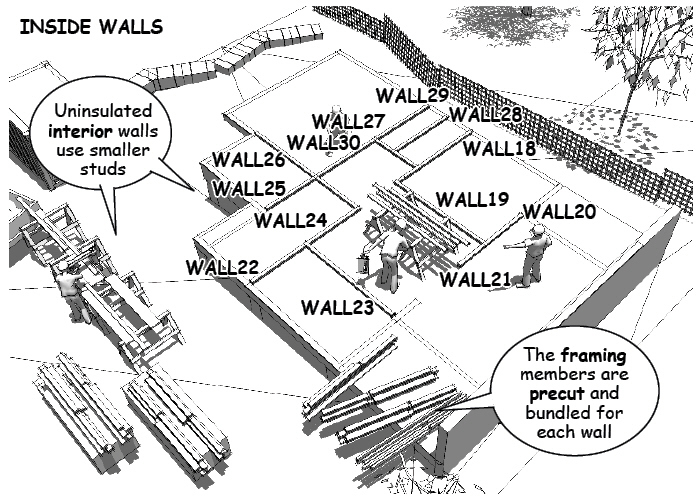 The idea is to safely separate the work for the wall framing, allowing skilled carpenters to check dimensions and the fit of the walls before they are assembled. The members in the bundle are laid out on the subfloor with the bottom plate positioned on the wall’s layout line. Sizes are checked and the pieces are nailed together while they are flat on the subfloor. Once assembled, the wall is tilted to stand vertically, moved into place and temporarily braced until the adjoining wall is installed. The bottom plate is then positioned exactly on the layout lines and nailed to the floor joists. 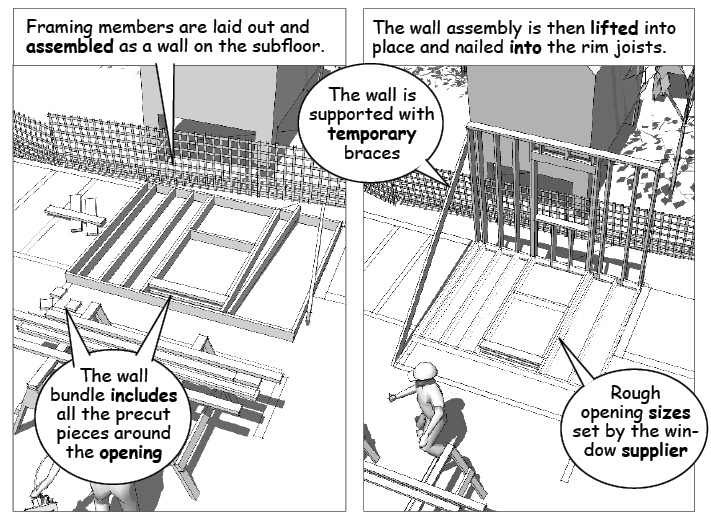 Solid blocking is added whenever a plate does not bear directly on a joist.